مستوری, اکبر, آزادفلاح, محمد, طارمیان, اصغر, افهامی سیسی, داود. (1396). بررسی تاثیر نانوذرات دی اکسید سریم بر خواص فیزیکی پوشش شفاف پلی‌یورتانی. مجله صنایع چوب و کاغذ ایران, 8(4), 645-656. اکبر مستوری; محمد آزادفلاح; اصغر طارمیان; داود افهامی سیسی. "بررسی تاثیر نانوذرات دی اکسید سریم بر خواص فیزیکی پوشش شفاف پلی‌یورتانی". مجله صنایع چوب و کاغذ ایران, 8, 4, 1396, 645-656. مستوری, اکبر, آزادفلاح, محمد, طارمیان, اصغر, افهامی سیسی, داود. (1396). 'بررسی تاثیر نانوذرات دی اکسید سریم بر خواص فیزیکی پوشش شفاف پلی‌یورتانی', مجله صنایع چوب و کاغذ ایران, 8(4), pp. 645-656. مستوری, اکبر, آزادفلاح, محمد, طارمیان, اصغر, افهامی سیسی, داود. بررسی تاثیر نانوذرات دی اکسید سریم بر خواص فیزیکی پوشش شفاف پلی‌یورتانی. مجله صنایع چوب و کاغذ ایران, 1396; 8(4): 645-656. در این مطالعه تاثیر نانوذرات دی‌اکسید سریم(CeO2) و اثرات ترکیبی آن به همراه نانو سیلیکا جهت بهبود خواص فیزیکی پوشش شفاف پلی‌یورتان بر روی چوب اصلاح حرارتی شده گونه نوئل(Picea abies) مورد بررسی قرار گرفت. برای این منظور فرمولاسیونی از پوشش‌های پلی‌یورتانی حاوی مقادیر مختلف از نانوذرات پس از آماده سازی بر روی سطح چوب اصلاح حرارتی اعمال شدند. حضور نانوذرات در ساختار پوشش نانوکامپوزیتی پلی‌یورتانی با طیف‌بینی پراش انرژی پرتو ایکس(EDS)تایید شد. سپس جهت بررسی اثرات نانوذرات بر پوشش، خواص چسبندگی، زبری سطح و سختی مورد ارزیابی قرار گرفتند. نتایج نشان داد که استفاده از دی‌اکسید سریم با کاهش زبری و افزایش مقاومت به چسبندگی، خواص سطحی پوشش پلی‌یورتان بر روی چوب اصلاح حرارتی شده را بهبود داد. علاوه بر آن سختی پوشش پلی‌یورتان در حضور دی‌اکسید سریم افزایش یافت. همچنین نانو سیلیس همراه با دی‌اکسید سریم در زمینه پلیمری، چسبندگی و زبری پوشش‌های نانو کامپوزیتی را تقویت کرد..
 Kocaefe, D., Poncsak S, Dore G. and Younsi R., 2008b. Effect of heat treatment on the wettability of white ash and soft maple by water. European Journal of Wood and Wood Products, 66(5):355–361. Mastouri, A., Tarmian, A., Agharafiee, E., Afshar, H., Mansouryar, I. and Rashedi, K., 2015. Investigation on physical and mechanical properties of poplar Thermowood, case study: Thermo-S produced by Afshar Group Co. First National Congress of wood and lignocellulosic products, May, 7931, University of Gonbad-e Qabus. (In Persian). El Bakali, I., Yagi, S., Hamzah, M., George, B., Merlin, A. and Deglise, X., 2014. Influence of Thermal Treatment and Impregnation on the Durability of Wood Colour. Jornal of forest product and indudtries, 3(1): 42-49. Nemetha, N., Tolvajb, L., Baka, M. and Alpar, T., 2016. Colour stability of oil-heat treated black locust and poplar wood during short-term UV radiation. Journal of Photochemistry and Photobiology A: Chemistry, 329: 287–292. Kesik, H.I. and Akyildiz. H.M., 2015. Effect of the heat threatment on the adhesion strength of water based wood varnishes. Wood research,60(6): 987-994. Kanokwijitsilp, T., Traipermc, P., Osotchana,T. and Srikhirina, T., 2016. Development of abrasion resistance SiO2 nanocomposite coating for teak wood. Progress in Organic Coatings, 93: 118–126. Mills, D.J., Jamali, S.S. and Paprocka, K., 2012. Investigation into the effect of nano-silica on the protective properties of polyurethane coatings. Surface & Coatings Technology, 209: 137–142. Jonoobi. M., Rahamin, H. and rafieyan, F.,2015. Cellulose nanocrystal properties and their applications. Iranian Journal of wood and paper industries, 6(1):167-192. (In Persian). Kaygin, B. and Akgun, E., 2009. A nano-technological product: An innovative varnish type for wooden surfaces. Scientific Research and Essay, 4 (1): 1-7. Saadat-Monfared, A. and Mohseni, M., 2014. Polyurethane nano composite films containing nano-cerium oxide as UVabsorber; Part 2: Structural and mechanical studies upon UV exposure. Colloids and Surfaces A: Physicochemical and Engineering Aspects, 441: 752– 757. Sow, C., Riedl,B. and Blanchet, B., 2011. UV-waterborne polyurethane-acrylate nano composite coatings containing alumina and silica nanoparticles for wood: mechanical, optical, and thermal properties assessment. Journal of Coatings Technology and Research, 8 (2): 211–221. Vitosyt, j., Ukvalberbergieno, k. and keturkisthe, g., 2012. Effects of Surface Roughness on Adhesion Strength of Coated Ash (Fraxinus excelsior L.) and Birch (Betula L.). Wood. Journal of Materials Science, 18(4):1392-1320. Kollmann, F. F. P. and Cote, W. A., 1984. Principles of wood science and technology, Springer, Berlin. Khojasteh Kosro, S., Ghofraniand, M. and Ganjaee Sari, M., 2015. The effect of adding zinc oxide nanoparticles on color change and adhesion strength of polyurethane coating on wood surfac. 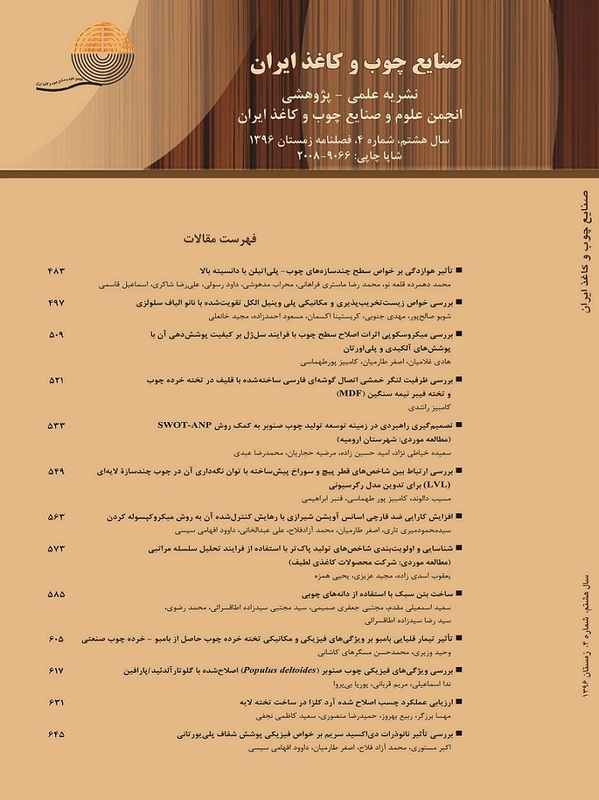 Iranian Journal of Wood and Paper Science Research, 30 (4):690-704. (In Persian). Labbani Motlagha, A., Bastanib, S. and Hashemia, M M., 2014. Investigation of synergistic effect of nano sized Ag/TiO2particles onantibacterial, physical and mechanical properties of UV-curable clear coatings by experimental design. Progress in Organic Coatings, 77: 502– 511. Ramezanzadeh, B. and Mohseni, M., 2012. Preparation of sol–gel based nano-structured hybrid coatings: effects of combined precursor’s mixtures on coatings morphological and mechanical properties. Journal of Sol-Gel Science and Technology, (64):232–244. Vlad-Cristea, M., Riedl, B., Blanchet, P. and Jimenez-Pique, E., 2012. Nano characterization techniques for investigating the durability of wood coatings. European Polymer Journal, (48): 441–453. Dhoke S. K., Rajgopalan, N. and Khanna, A. S., 2012. Effect of Nano-Zinc Oxide Particles on the Performance Behavior of Waterborne Polyurethane Composite Coatings. International Journal of Material Science, 2(2):47-55. Cristea, M. V., Riedl, B. and Blanchet, P., 2011. Effect of addition of nanosized UV absorbers on the physico-mechanical and thermal properties of an exterior waterborne stain for wood. Progress in Organic Coatings, 72(4): 755-762. Cristea, M., Riedl, B., Blanchet, P. and Jimenez-Pique, E., 2012. Nanocharacterization techniques for -investigating the durability of wood coatings. European Polymer Journal, 48(3): 441-453.